Professor Sue Carter was called to testify because of her unique insight as a scientist, researcher, and entrepreneur. A seven-year-old National Science Foundation program provides considerable benefit to universities, investors, taxpayers, the American economy, and society at large, a UC Santa Cruz physics professor told a congressional committee. Professor Sue Carter offered testimony on NSF Innovation Corps (I-Corps), which assists scientists and engineers in discovering commercial applications for their research. Carter appeared before the United States House Committee on Science, Space and Technology. “The strength of the NSF I-Corps program is that it pushes researchers out of the lab and into the community to talk to potential customers, enabling them to better understand the societal value or lack thereof that their research has,” Carter said during the December 5 hearing in Washington D.C.
I-Corps was created and funded by the National Science Foundation—a federal agency tasked with supporting scientific and engineering research—in 2011. The program came after the discovery that scientists were experiencing difficulty in transforming the products of their research into something the general public could use. The program’s creators wanted to unleash the transformative potential of cutting-edge scientific research with the goal of bringing to market innovations in quantum computing, artificial intelligence, genetic engineering, and more. I-Corps is comprised of eight regional hubs, or “nodes” as they are called, and has already graduated hundreds of teams of researchers who have attended classes held at 86 universities around the country. Carter was called to testify because of her unique insight as a scientist, researcher, and entrepreneur. Along with having been a three-time participant in the program as a team member, she also runs the site at UC Santa Cruz, allowing her to provide insight as both a student and a teacher. 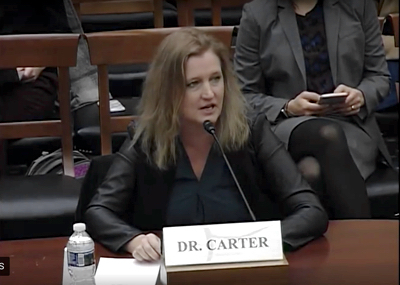 Having been involved in two solar technology companies before her encounter with I-Corps, Carter told lawmakers the program would have been indispensable in helping her and her associates engage with potential customers and identify what aspects of their breakthrough were useful to the market. “If we had the experience of the NSF I-Corps program, I am confident we would have come to the correct product decision two years earlier,” Carter said of her second experience at a company called Solexant, which focused on developing a thin-film solar cell. Instead, the company pivoted later to a new technology, enabling China to garner a larger market share in the thin-film solar industry, she said. Since going through I-Corps, Carter succeeded with the research-to-market transition. “The two companies started after NSF I-Corps resulted in us being able to sell a commercial product to customers with much less time and funding,” Carter said. The professor added this concept is broadly applicable, particularly since so much scientific research is funded by the federal government through grants. In this context, I-Corps provides a useful tool in ensuring taxpayer money is used more efficiently with a greater potential for beneficial social impact, she said. The program also benefits undergraduate and graduate students, Carter said. Illinois Congressman Dan Lipinski asked if the program could be a catalyst for rejuvenation in economically depressed areas. Carter said UC Santa Cruz’s standing as a Hispanic Serving Institution and its proximity to economically depressed areas like the Salinas Valley mean its version of the program served the underprivileged. Despite lingering concerns from some on Capitol Hill about the funding of science programs in general, the lawmakers seemed enthusiastic about the program’s present and future. While many of the program’s alumni, including Carter, have brought successful products to market as a result of I-Corps, just as important is the fact that people are able to fail quicker rather than wasting years and resources in trying to develop commercial applications no one needs or wants. Carter said I-Corps could be expanded to include lessons on how to talk to venture capitalists, the legal context for startups and their product, and expanding the training to entrepreneurs outside the scope of students, faculty, and mentors.